I wrote in a recent blogpost about Franny and Zooey by J.D. 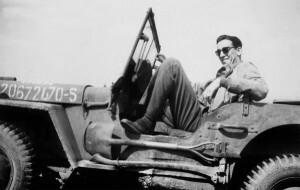 Salinger (1919-2010). 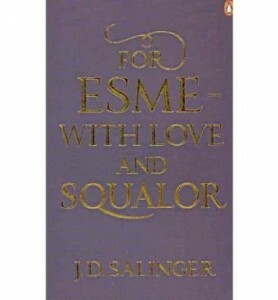 For Esmé, with Love and Squalor was published in America as Nine Stories in 1953, two years after The Catcher in the Rye. Both books were bestsellers. 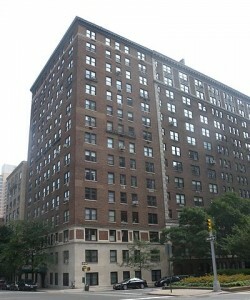 This was also the year he left New York City and moved to Cornish, New Hampshire, where he spent the rest of his life. There he became increasingly reclusive and litigious; he published just four more stories in the next seven years. Salinger was drafted into the army in 1942, and served in the infantry until the end of World War II; he took part in the D Day invasions, and in the subsequent campaigns across Europe until the downfall of the Third Reich. He was assigned to a counter-intelligence unit, using his knowledge of French and German to interrogate prisoners of war. In spring 1945 he entered a liberated concentration camp. Recent biographies have indicated that he was deeply traumatised by this and other wartime experiences; he possibly suffered from what is now called PTSD, and spent some weeks in hospital recuperating. This metafictional form is also seen in the title story; like Seymour, the Sergeant who calls himself ‘X’ is suffering from battle combat fatigue (or PTSD) – he has the shakes, facial tics, and can’t sleep. The precocious, rather coquettish young girl, Esmé, whom he’d met in a tearoom in the first part of the story, when he’d been stationed in Devon undergoing training prior to the D Day landings, brings him the peace of sleep when he reads her affectionate letter to him. You take a really sleepy man, Esmé, and he always stands a chance of again becoming a man with all his fac- with all his ‘f-a-c-u-l-t-i-e-s intact. In mirroring her last words to him in the tearoom, and the innocent-adult way in which she’d spelt out the word ‘slain’ to protect her little brother, X demonstrates that she’s brought him the kind of peace (or love) that passes all understanding. It’s a deeply moving moment, and one doesn’t have to be a believer in Christ, the Buddha or any mystic or guru to respond to it positively. The cheesy US Ace paperback cover: what were they thinking? In the unlikely setting of a commandeered Nazi woman’s house in Germany, Sgt X finds the epiphanic peace that eluded Seymour, whose death haunts all the stories about the Glass family. That his release is brought about by the innocent affection of an orphaned girl – a lonely soul, like him – is characteristic of Salinger’s fiction. ‘Down at the Dinghy’ is the only other Glass family story in the collection. Boo Boo Tannenbaum, née Glass, talks with her four-year-old boy Lionel, who’s been upset by a crass racist remark by one of the servants. As Zooey manages to use big brother Seymour’s wit and wisdom to bring about Franny’s rehabilitation when she was enduring existential despair in Franny and Zooey, so Boo Boo is able to talk Lionel round to a kind of emotional stability. In his innocence he doesn’t realise the full significance of the ugly word the servant had used. Redemptive innocence crops up frequently in the other stories. In ‘Teddy’, the eponymous ten-year-old is a kind of savant; he’s been touring European universities with his parents, propounding his mystical insights and prophetic visions to incredulous professors. On the ocean liner en route for home in the USA he’s engaged in conversation by a young academic who wants to learn about his spiritual gifts. Teddy talks with the precocity blended with naiveté that was seen in Esmé. For example he asks the young man if he’s a poet. No, he replies, why did Teddy think he might be? Poets are always taking the weather so personally. They’re always sticking their emotions in things that have no emotions. I mean it’s very hard to meditate and live a spiritual life in America. People think you’re a freak if you try to. My father thinks I’m a freak, in a way. And my mother – well, she doesn’t think it’s good for me to think about God all the time. She thinks it’s bad for my health. Like the Glass siblings, Teddy is so gifted, precocious and extraordinary – he’s another of Salinger’s youthful geniuses – he’s sort of deranged, an outsider, unable to thrive in the world of ordinary people. In Franny and Zooey, Zooey says to his mother that he and his sister are freaks; he blames Seymour and Buddy for teaching them oriental religion – it’s enlightened them, but made them unfitted for life in unenlightened post-war America. In ‘Franny’ his sister had declared a similar dissatisfaction with everything. ‘Nobody’s aiming to please, here. More, really to edify, to instruct’, said the narrator of the title story of this collection, in setting down his thoughts about Esmé. 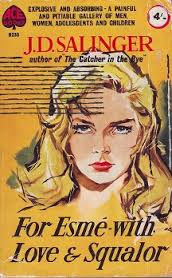 Some critics have taken exception to Salinger’s precocious, ingenuous young characters and their guru-like tendencies; they don’t like what one called his glamorising of self-pity and his elevation of the Glass family to the status of sanctity, full of ‘stricken sensitivity’. That I think is understandable – Seymour and his fellow devotees of Dharma can come across as a little smug or priggish – but the warmth and humanity of Salinger’s stories more than compensates for this occasional earnestness. Passages like this one in ‘Esmé’ could easily grate: Sgt X picks up a book by the German woman Nazi arrested by him and in whose house he now stays. He reads the fly-leaf inscription she’d written in the book by Goebbels: ‘Dear God, life is hell’. In his traumatised, nerve-shot state he finds this a ‘classic indictment’, and struggles, ‘against heavy odds, not to be taken in’. This typically enigmatic quotation (from Dostoevsky) is one of many such gnomic, often Zen or Hindu philosophical notes in Salinger’s stories (the long list of mystical quotations from Seymour and Buddy’s door in Franny and Zooey fits into this same category; we’ve just seen Teddy’s dharma views). Some critics have found such pronouncements pretentious and discordant; I think they’re quite endearing. I don’t think he’s showing off – and why shouldn’t he write from his own spiritual point of view? Dostoevsky did. Why not rail against the ‘phoniness’ of materialist American culture and insincerity in people, and strive for authenticity? In her letter Esmé wrote that she hoped that D Day would bring about a ‘swift termination’ of the war (she loves those polysyllabic nouns!) and ‘a method of existence that is ridiculous to say the least.’ This is inadvertently what she has brought about for Sgt X. She’s shown him an alternative to the phony ridiculousness of life. I am giving Sister Irma her freedom to follow her own destiny. Everybody is a nun. That he does so, pretentiously, in French, adds an ironic dimension that diminishes his pomposity; Salinger’s humour and affection prevent the story from overbalancing into affectation – and the young man does seem to have undergone a life-changing experience. The sententiousness is of the same order as Esmé’s gauche attempts to sound grown-up by employing expressions she doesn’t fully understand. 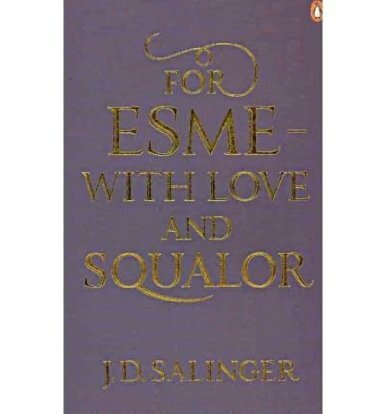 This entry was posted in American Literature and tagged For Esmé with Love and Squalor, J.D. Salinger by Simon Lavery. Bookmark the permalink.